DD5LP/P – March 28th 2016 – DL/AL-167 Falkenstein. Originally planned 10 days earlier to be activated with Eisenberg, time was running out to get Falkenstein (a reasonably easy summit) in before the end of the 3 point winter bonus. I would have liked to have also activated the nearby DL/AL-166 Zwolferkopf, however as the wife initially agreed to come along, I dropped that extra 2-2.5 hour commitment. I then decided I would try use 80m during the activation and stay a little longer at Falkenstein. As it turned out my wife could not come along after all. As I wanted to try 80m and I knew space was at a premium (especially on this Easter Monday when I expected several other visitors to be there), I decided I would take my 10 metre mast along as well as the normal 5 metre one, as if I could get the centre of the linked dipole higher, I would not need to go out as far as I would with the five metre mast to get the 80m dipole in and not touching the ground. I had activated Falkenstein previously along with Zwolferkopf, which used to be a dual-summit with both German and Austrian SOTA summit code allocations but no longer has this added attraction. Falkenstein sits above the town of Pfronten very close to the Austrian-German border. The access to Falkenstein is interesting in that it is via a private one-way road that is open in the upwards direction for 40 minutes of the hour and in the downwards direction for 10 minutes of the hour (there is a 5 minute gap between the two time zones to avoid contention of the road use). Access to the road costs €4 payable at the start of the road in a machine in a pay and display operation. The drive up the road is interesting with tight hairpin curves and no protection on the side of the road from sheer drops at some points. It takes less than 5 minutes to navigate up the road. The small public car park is located about 50m vertical height below the summit. There are car parks further up the hill but these are reserved for the people staying at the hotel under the castle (a rather expensive, high class one). The first time I was at Falkenstein I saw Ferrari’s, Jaguars, a Lamborghini and a couple of the top end Audis, Mercedes and BMWs, so you can judge the clientel of the hotel. You have to actually walk up through the hotels car park to the start of the path up to the castle. There was a big sign saying no winter service – which means the path is not cleared in winter and while to this point there had not been very much snow around, the path had hard packed ice and snow on it making it difficult to climb safely. Luckily I had chosen to put my hiking boots on at the car, despite the bright sunshine and probably 8-10 degrees temperature. After setting off from the car, I actually turned back and collected the fasten-on spikes for my boots. A decision that was a very good one when I needed to come back down with more weight than usual, with the extra mast. On arriving at the castle ruins (the highest in Germany and another of King Ludwig II’s buildings) I first looked at whether I could possibly set-up at the front of the castle with the antenna basically on the front wall of the ruins. This of course would be far from ideal and also would block access for the public. The last time I came, I set up at the rear of the ruins but again the high castle walls did nothing to help my signal. I decided to take a look inside and although not obvious there is a section or railing that is actually a gate that your can go through and although there are no more floors inside the (church sized) castle, steps have been built up to a viewing platform at the far end of the ruins. As I was the only one there at the time I decided to check this out as a location. The fact that when I got to the top there was a table there, made my decision for me. Unfortunately I would not be able to get an 80m antenna in here either, so all thoughts of trying 80m were dropped. Perhaps next time an end-fed half wave antenna thrown out down the hillside from the top of the castle ruins could be an option? In any case this time I got busy and put up the usual Aerial-51 40m OCF but this time on top of the 10m mast as space was also cramped for this antenna. For the first time in many activations, I was able to fly the SOTA flag, although with no wind, it drooped more than flew. After 15 minutes the equipment set up – FT817 + Ramsey QAMP + Aerial-51 OCF on the 10 metre mast. This was a trial of the new modification I had made to the fan in the amp, so that it only turns on when I am transmitting (and so avoids the rf-noise from the brushless fan motor) and with an increased output of 20 watts on 20m and 30 watts on 40m by running the amplifier at 16v. I decided to start on 20m – no fan noise, great but then I realised there was still some QRM and remembered what I had found the last time I was here. Something – most likely the microwave relay or mobile phone cell station on top of the hotel puts out so much RF hash across 10m through 20m that signals have to be really strong to be worked. My first 3 contacts on 20m were difficult and I decided to switch to 40m which doesn’t have this RF interference but was full with activity making finding a free frequency difficult. I had to move a couple of times due to interference from other stations. I finished off the activation on 20m with quite a few contacts despite the local QRM and assisted by headphones. I actually managed 3 S2S contacts during the activation, which was a nice bonus. During my activation, more and more people came up to take in the views and I ended up explaining what Amateur Radio is to a couple of semi-interested people. One surprising visitor was from my home county in the UK, East Yorkshire and he had previously known a local Radio Amateur some 40 years earlier in Hull, so it was good to have a bit of a chat in English for a while. The weather was beautiful however rain had been forecast for the afternoon and while more and more visitors were arriving at the ruins, I decided to call it a day at about noon local time after a one hour activation. After packing up (which took a while longer than normal as I had to do it around the people there), I carefully picked my way down the path and stopped to put the spikes on my boots at the most icy spot (which despite the sunshine, still hadn’t melted). I arrived back at the car 5 minutes late for the downward time window for the private, single track road. I wasn’t worried, it gave me a chance to eat my packed lunch and check a few emails (no problem with 3G/Internet coverage from this summit). The drive home was uneventful and the forecast rain only came the next day. All in all a nice day out which if I had tried to do Zwolferkopf as well might have been too much. I’ll go back and do that one in summer when the track up through the forest will be both clear of snow and easier to see. Ramsey QAMP 20/40m amplifier & PSU (5Ah 3S LIPO plus battery booster). 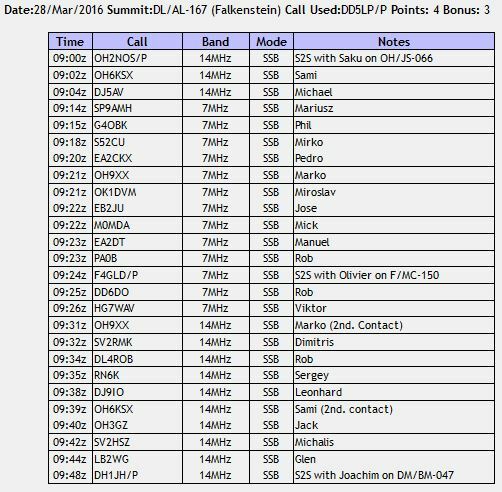 Propagation is still not good – in fact it’s probably as bad as I have experienced on a summit and the extra power from the QAMP definitely helps to get me heard over the QRM. If with higher band propagation getting generally worse, using 80 metres is going to provide a physical challenge. Getting an 80m dipole in on some of the busier summits like this one will be difficult. End fed antennas may be an answer as long as we can also get the needed counterpoise out as well. The QAMP is working well with the increased power output, but there is still probably 1 S-point of noise added when the amplifier is turned on as this is no longer coming from the brushless fan I need to find where it is coming from – perhaps the battery booster when it is on load, even just the small load of the RF-Vox circuit in the QAMP. Perhaps I need to trigger transmit directly from the FT-817 accessory socket rather than using RF-Vox. One thing is for certain, the amount of receive noise added now is a lot less than when the fans were running on receive. This entry was posted in SOTA and tagged DL/AL-167, Falkenstein, SOTA by VK2JI DD5LP G8GLM. Bookmark the permalink.